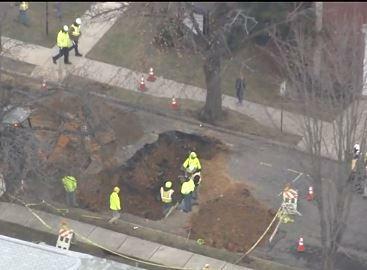 BETHLEHEM, Pa. - A sinkhole has collapsed part of a Pennsylvania city street and a gas leak believed to be caused by a ruptured main forced the evacuation of several homes. The Bethlehem Fire Department says about 30 residents had to leave their homes early Wednesday. A four-block area has been closed to traffic. Bethlehem is about 70 miles north of Philadelphia. Fire Chief Robert Novatnack says firefighters were called to the scene around 3:20 a.m. and detected a strong odor of natural gas, including inside some homes. The gas was shut off after several hours and utility crews were making repairs. CBS Philadelphia reports that several evacuated residents are sheltering at a nearby middle school. Officials have not provided a timetable for when residents can expect to return, and all utilities to the neighborhood remain shut down. A UGI utility company worker was injured when he fell into the hole. He drove himself to the hospital as a precaution.